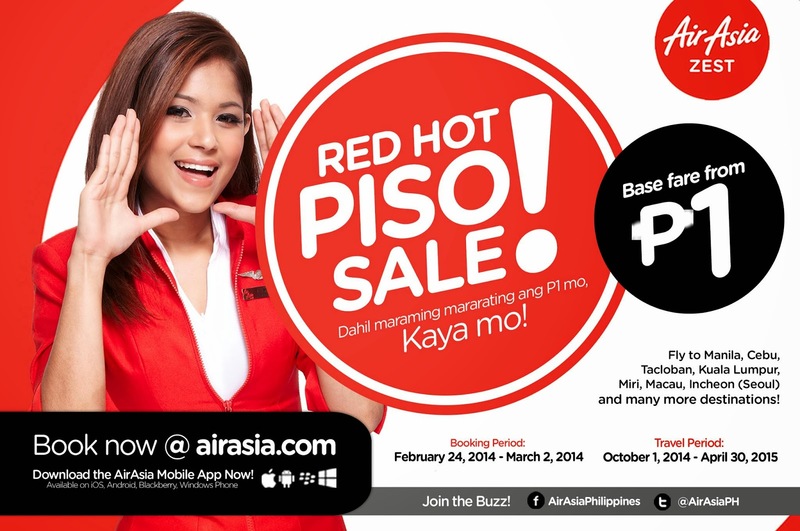 Piso Fare 2019 Promos Until 2020: Piso Fare 2014 to 2015 from Air Asia Zest! Piso Fare: Be the first to know on any piso fare info! Now this time, we introduce AirAsiaZest Piso Fare promo! This is their RED Hot surprise for you! You want it, you got it! Fly to their awesome destinations from P1 base fare only! Selling period: 24 Feb, 00:01 hours GMT+8! So do prepare your keyboard to book your flights! Travel period: October 1, 2014 to April 30, 2015! Fly to Manila, Cebu, Tacloban, Kuala Lumpur, Miri, Macau, Incheon (Seoul) and many more destinations! Ang hirap.mag pa book,i've waited for 12:00mn to come tpos pag browse puro on queue and waiting list,inabot n ng 2am di din nkapag pa book,lgi lumalabas eh int'l flight..